Teachers and students have long known the benefits of arts education, whether it be formal teaching and learning in specific subjects such as Art, Music, Drama, Dance or Media, or whether incorporating arts into more traditional ‘academic’ subject areas such as Maths and Science. The problem is, of course, that school administrators and the education bureaucracies to whom they are beholden do not always understand or appreciate the enormous value of arts education for young people. Far too often, arts subjects are seen as the ‘fun’ options suitable for those students who “can’t handle the hard subjects”. I remember a recent experience of a student transferred into my Film, Television and New Media class. Upon enquiring to the Deputy Principal who facilitated the subject change, I was advised that the student had been doing Chemistry but was struggling and wanted to do something ‘easier’. Needless to say, this student struggled with the workload and academic rigour of FTV&NM and subsequently transferred again, no doubt still seeking that elusive ‘easy’ subject. I was far from happy with such an assumption about the subject, but I wasn’t surprised. 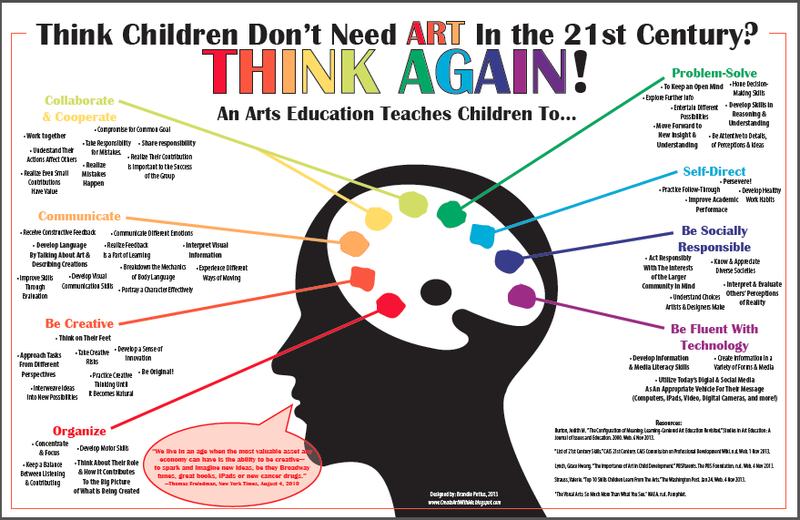 I had experienced such attitudes in other schools with regard to this subject and other arts subjects. This was the same Deputy Principal who had also decided, without any consultation with teachers, that Film, Television and New Media should be part of the English faculty, rather than the Arts faculty, which provides some indication of their complete lack of understanding about this subject specifically and The Arts more broadly. It’s not that I wanted this student to fail. 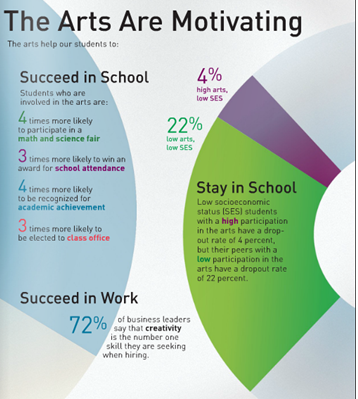 It’s just that school administrators don’t fully understand the fact that The Arts are not an easy option. I would have preferred that he stay in the class and reap the benefits that only arts education can offer. Art cannot simply be dismissed as “painting pictures” or “making movies”. The Arts enable young people to develop new ways of thinking and communicating, encourage creativity and imagination and the opportunity for personal expression in ways that other areas of study do not. The Arts encourage young people to be creative and provide access to the tools to do so. The Arts can be hard work, but ultimately they provide young people with the skills that will enable them to participate effectively and successfully in a rapidly changing world. Research undertaken by the University of Sydney examined the academic and personal wellbeing outcomes of students from 15 Australian schools over two years. The research found that “students who engaged with the arts in schools as active participants – as makers and doers of the arts – were more likely to do better in academic and social spheres than those who passively consumed the arts.” Furthermore, research undertaken by The Australian Council for Educational Research (ACER) concluded that “involvement in arts programmes has a positive impact on students’ engagement” and that “there are strong demonstrated relationships between arts in education and students’ broad academic (including literacy and numeracy) and social achievements.” Nobody who teaches The Arts would be surprised by such findings, however we still too often find that it is Arts subjects the first to be jettisoned when the “demands of a crowded curriculum bear down on time and resources.” Clearly, reducing access to arts education in our schools is compromising student outcomes and reducing their opportunities to achieve in other areas of their lives. The special report Why Arts Education Must Be Saved provides a range of perspectives and insights through a series of accompanying articles about the importance of arts education. Whilst arts teachers already know of the enormous benefits that arts education offers our students, it is vital that this understanding is shared by those who ultimately determine what subjects are offered, how they are offered and to whom they are offered. School Principals and Deputy-Principals must understand the value of arts education if we are going to see these subjects afforded the respect and privilege assigned to other fields of study. Not only do schools need to be offering a wide range of arts subjects, they also need to make sure that students are to able to develop a program of study that incorporates multiple arts disciplines, should they so desire. I have experiences in one school that offered Art, Drama, Music and Film Television and New Media but had timetabling structured in such a way that all four subjects were on the same ‘line’ which therefore meant that no student could study more than one of these. What about the student/s who might want to study more than one of these subjects (or even all four)? I have seen similar timetabling clashes in other schools and it is infuriating because, whilst it is a common scenario with the scheduling/timetabling of arts subjects, I have never ever seen students forced to make such compromises in other subject areas. Heck, Kate Miller-Heidke was forced to change schools just so that she could study both Music and Drama and it doesn’t seem as though much has changed since then. Of course, choosing multiple Maths or Science subjects is perfectly okay, but heaven forbid that any student might want to select a course of study focussed primarily on Arts subjects. “If there are less than 12 students who enrol in the subject it won’t be offered.” This was the message I was given one year when student numbers for one of my FTV&NM classes was below this figure in the early days of the period allocated for students to make their subject selections for the following year. This was the justification as to why Drama was not currently being offered and it could be argued that such a policy is reasonable given the demands on school funding. In the end though, the final student numbers were more than sufficient and my classes went ahead as planned. However, I was extremely annoyed to discover that both Chemistry, Maths C and Ancient History were also proceeding even though each class had less than 10 students (one class had as few as 6). I was not amused and when I raised my dissatisfaction with the power-that-be, I was advised that “these subjects are important and it wouldn’t be fair on the students if we didn’t offer them.” Such a statement makes it clear that subjects such as Drama and FTV&NM and the students who want to study them are not important and can therefore be sacrificed. Nobody will ever convince me that the likes of Chemistry or History or any other subject for that matter are any more, or less, important than any Arts subject. We need all schools to take The Arts seriously and hopefully the development and implementation of the National Curriculum will go some way to achieving this, although this won’t necessarily be the case in senior secondary studies which is where The Arts is often seen as being somehow less important or worthwhile, as ludicrous as that sounds to those of who know better. Only when all schools are demonstrating a commitment to arts education that is genuine and equal to their level of commitment to all other areas of study can we be assured that students are being afforded an opportunity to secure an education that provides them with the opportunities to develop the skills and knowledge necessary to find success and fulfilment in their life beyond school. In fact, any school that is not affording all their students the opportunity to study a comprehensive program of arts study is fundamentally failing in their responsibilities to prepare young people for a world in which creativity, imagination, resourcefulness and innovation are considered THE critical skills for success in the world beyond school.